Lockheed Martin required Q-PLUS Labs' measurement expertise to generate quick results via 3D scan data of the rear doors of the USS Freedom in San Diego, California. As a new breed of warship, the littoral combat ship (LCS) was designed to be a fast and formidable surface combatant with warfighting capabilities such as mine clearing, anti-submarine and anti-surface warfare. 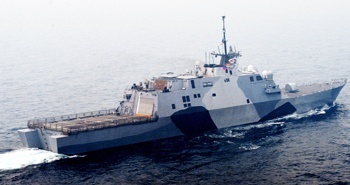 At 378 feet in length and composed of a high speed, semi-planing steel monohull with an aluminum superstructure, the USS Freedom is a unique ship. It is the first-in-class littoral combat ship of its kind and is able to operate in a variety of environments and assignments from dangerous shallow water and near shore missions to minesweeping and humanitarian relief. Q-PLUS Labs went onsite with portable measurement equipment, using a range scanner to collect massive amounts of data in a highly time sensitive assignment, then post process it into the needed readings and analyses. 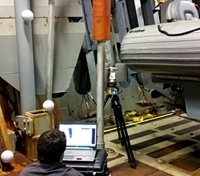 Collecting data with the Faro Photon range scanner, which is capable of measuring roughly the length of a football field in every direction, Q-PLUS Labs' engineers were able to overcome the scanning obstacles involved with measuring onboard a currently active warship. One of the challenges in the scanning process was collecting scan data of exterior doors which involved attaching a harness an engineer as he maneuvered the equipment overboard. In order to quickly move the USS Freedom out of port, Q-PLUS Labs was required to acquire the data rapidly and accurately, delivering results which would be used to improve the design of the ship's rear doors. 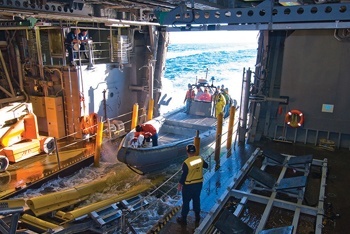 These doors are located near waterline level to allow safe launch and recovery of watercrafts while the ship is in motion. The accuracy of the doors' measurements would allow for improved design to resolve the problems being caused by the shape and position of the currently installed doors. Case Study Update (11/19/15): Q-PLUS Labs is completing a very special and unique 3D scanning project on the USS Freedom's sister ship, the USS Independence! Look for the upcoming case study.